(Nanowerk Spotlight) Paper electronics – putting flexible electronic sensors and other circuits on regular paper – have the potential to cut the price of a wide range of medical tools, from point-of-care diagnostic tests to portable DNA detectors. Scientists have already developed a fast, low-cost way of making paper sensors by directly printing conductive ink on paper. Other researchers have designed and demonstrated novel self-powered human-interactive transparent nanopaper systems, utilizing transparent nanopaper as base material. 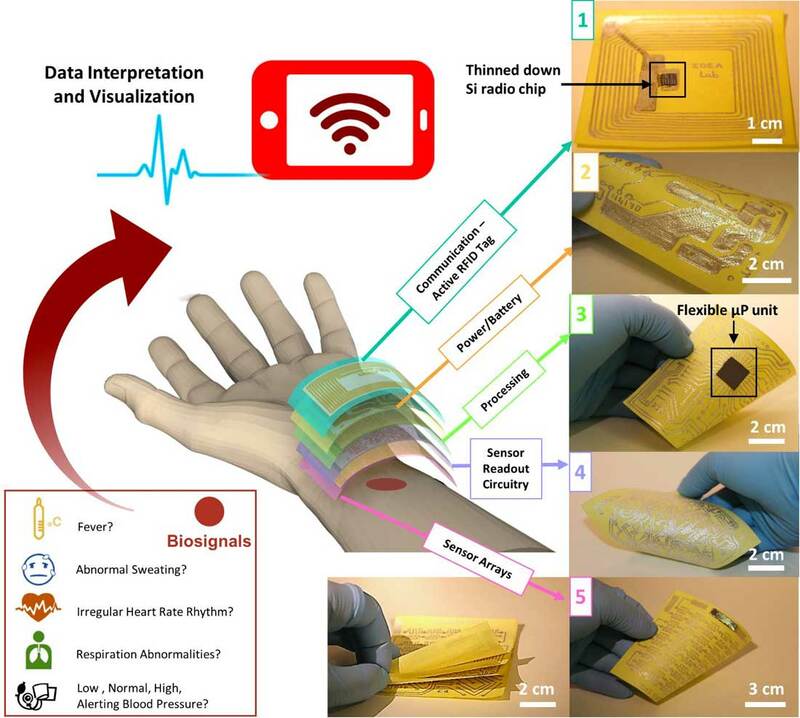 In new work, published online in Advanced Materials Technology ("Recyclable Nonfunctionalized Paper-Based Ultralow-Cost Wearable Health Monitoring System"), researchers have now shown an integration strategy to rationally design an ultra-low cost health monitoring device, a Paper Watch, using recyclable household materials: non-functionalized papers. "The unusual simplicity in manufacturing and in daily use gives our Paper Watch unprecedented edge compared to any previous demonstrations," Muhammad Mustafa Hussain, an Associate Professor of Electrical Engineering at King Abdullah University of Science and Technology (KAUST), tells Nanowerk. "We integrate pressure, temperature and humidity sensors with flexible silicon integrated circuits on one singular platform." Hussain's team demonstrated reliability under physical deformation for their paper sensor device, which for the first time can sense the body vitals of the carrier (body temperature, blood pressure, heart rate, and skin hydration) simultaneously and in real-time. In a previous Nanowerk Spotlight we have reported on the team's use of household items – aluminum foil, scotch tapes, sticky-notes, napkins and sponges – to make a multi-sensory 'Paper Skin'. Following up on these studies, Hussain's lab now demonstrates a fully autonomous, low-cost and recyclable health monitoring system based on common, i.e. not functionalized, recyclable household paper. To build their sensory platform – integrates pressure, humidity and temperature sensors – the scientists integrated thinned down flexible bulk monocrystalline Si (100) based data processing units on paper substrates. Other resources used were post-it notes, double-sided adhesive tape, aluminum foil, and tissue wipes. A combination of such electrically conductive and insulating material can result in various capacitive and resistive elements. Read the above-mentioned Nanowerk Spotlight for details on this fabrication process. "Our vision towards an autonomous wearable device is to replace the flexible printed circuit board with printed stretchable metal-interconnects on a low-cost paper platform, where careful integration and alignment of flexible processing units is performed through flip-chip technique," explains Joanna Nassar, a PhD student in Hussain's lab and the paper's first author. "Compared to previous demonstrations, our system uses recyclable papers instead of chemically treated materials, displays a simpler and affordable integration approach, improved contact intimacy with the skin, and exhibits a smaller footprint on the environment." The team says that the accuracy of their paper watch falls within ±5% of that of Apple Watch, Fitbit, Pebble or Samsung Galaxy Gear. But the cost? Without even high volume manufacturing, it is less than $25. The next stage of this research will be to add therapeutic capability and commercialize this technology. "Technologically, we look forward to ensure further sensitivity, accuracy, selectivity and responsivity," says Hussain. "We are developing a plug and play sensor interface to disrupt the status-quo. We are presently working with multi-national investors from China, USA and Saudi Arabia in that regard."